CEREAL…everyone loves it!…The awesome crunch combined with cold milk, the ease of throwing it quickly in a bowl and the delicious blended flavors of the grains and fruit. However, most cereals are extremely processed and full of added sugars resulting in it being a dessert and not the best way to start your day or your child’s, for that matter. So, although I don’t recommend eating it everyday, here are some tips for when you do decide to enjoy that yummy bowl of goodness! Use organic milk or an unsweetened non-dairy milk with safe ingredients. Check out my Delicious Almond Milk Recipe or my Creamy Coconut Milk Recipe. Always add in good fats such as nuts or a little nut butter. Power it up with a spoonful of chia seeds and hemp seeds. 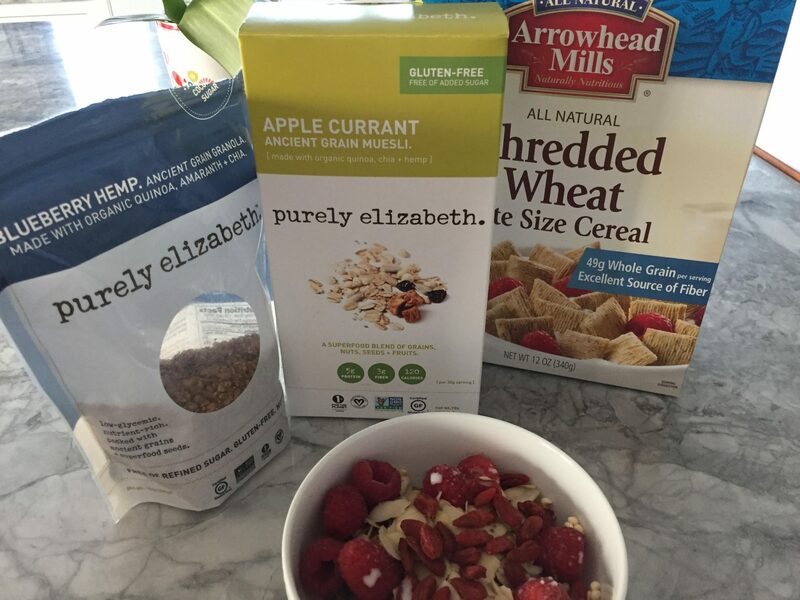 Lastly, take a look at your cereals and replace them with ones that are low in sugar and have whole grains. It will take a little time to adjust but the added fruits and dried fruits will help the transition. Muesli is generally a healthy option. Granola that is low in sugar really makes a big impact. I LOVE the Purely Elizabeth ones. If that fails in your household, always stick to organic or Non-GMO Project verified. See if you can sneak in the lower sugar version of your family’s favorite. Add fresh fruit and nuts to pump it up. Slowly work your way towards the healthier options. Turmeric Cardamom Oats5 TIPS for choosing Peanut Butter!